Preheat oven to 350 Shell hazelnuts. Roast nuts on a baking sheet for 10 to 15 minutes and remove from oven. Allow to cool to room temp. Coarsely chop nuts and place in a large glass container. Bruise Angelica root with a morter and pestle, and add to container. Add vodka. Cap tightly and put in a dark place for 1 month. Shake occasionally. Pour mix through cheesecloth to remove all particles. After straining and filtering, measure the volume of the alcohol mixture. It should be 28 oz. If volume is less, add more vodka to make up the difference. In a large sauce pan bring the water to a boil. Add sugar stirring til dissolved. Allow to cool to room temp. Add syrup to alcohol mixture. Stir in vanilla and almond extracts, glycerine and food coloring. Allow to age in an air tight container for 3 months. A second straining may be required after aging. 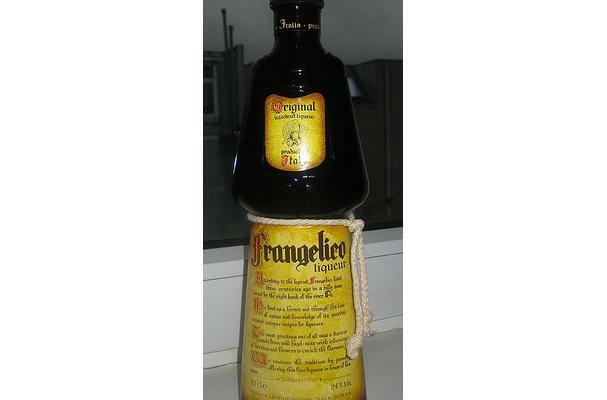 Homemade frangelico is easy to make, but be prepared to wait- it takes 4 months from start to sip.